In July 1799, the Revolutionary War came to the Upper Delaware River Valley as a British-aligned militia led by famous Mohawk chief Joseph Brant raided the area to strike a blow at the morale of the revolutionaries. Incensed by the raid, a rapidly-formed counterforce under the command of Colonel John Halthorn tracked down Brant’s Volunteers and staged a botched ambush that resulted in a lopsided loss for the rebels. The site of the Battle of Minisink on July 22, 1779 is now preserved as part of Minisink Battleground Park, itself a subset of the broader Upper Delaware Scenic and Recreational River, which spans the border of New York and Pennsylvania. 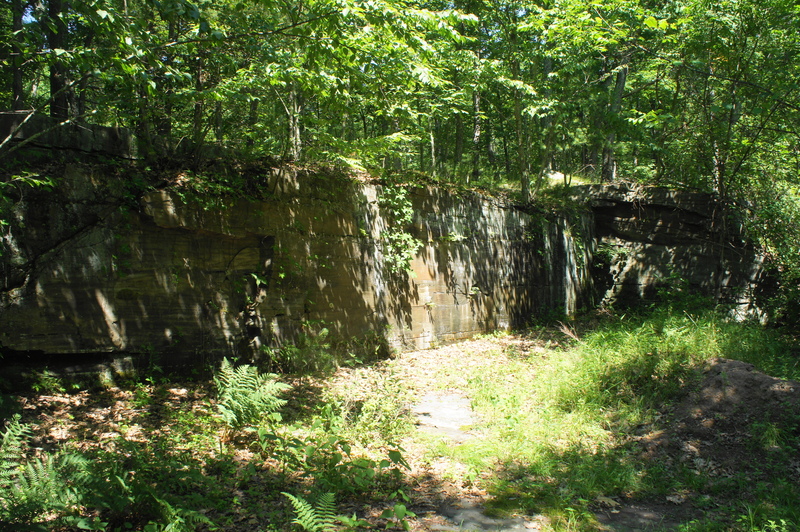 A loop trail offers hikers a brief tour of the battlegrounds. 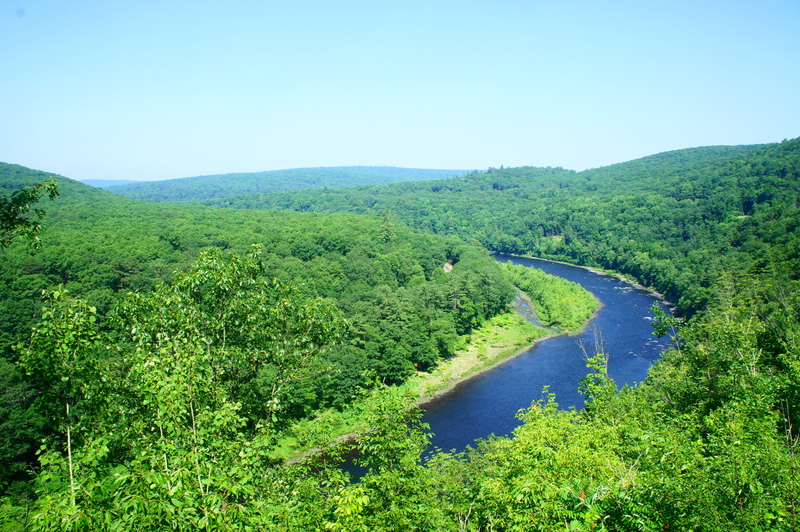 Situated in the hills opposite Lackawaxen, Pennsylvania, Minisink Battleground Park is reached by way of a narrow but paved road on the New York side of the Delaware River. At the parking area is a small Interpretive Center with maps and information on the park and area. The loop hike begins just behind the center to the right. 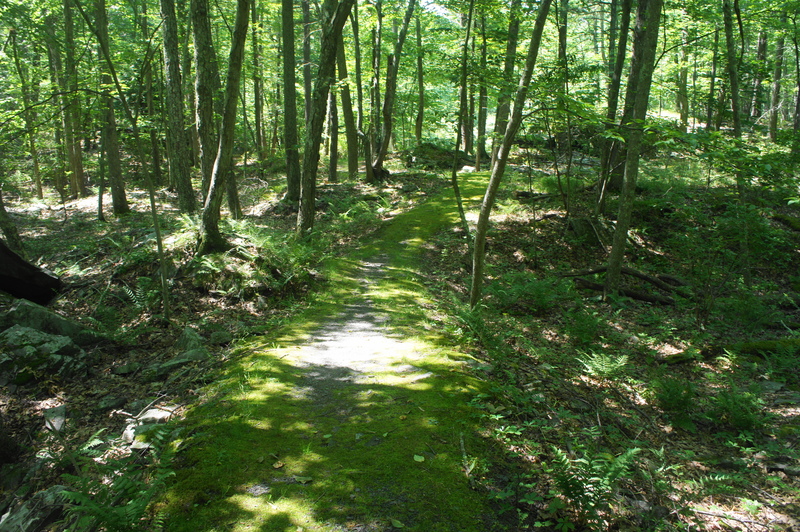 Start on the wide and grassy Woodland Trail as it bears north and quickly intersects the Battleground Trail after around 50 yards. Bear right. Within a minute, a very brief spur trail bears left for a slightly better view of an underwhelming wetland before quickly merges again with the main path. At 1/10 mile, the footpath spills out onto Zane Grey Way Road, which is paved but blocked to vehicle traffic. Bear left on the road and follow it uphill to a grassy field with a set of monuments. 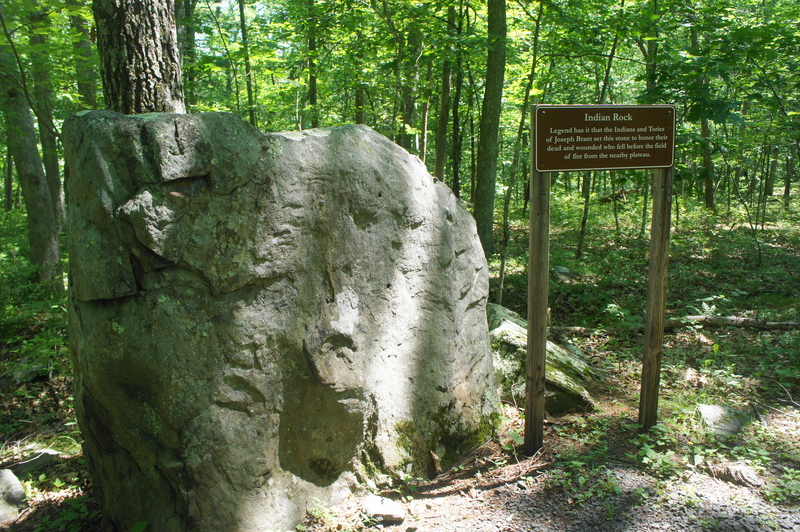 One is a stone marker constructed in 1929 to commemorate the fallen revolutionaries at the Battle of Minisink, while a new monument—a large rock with a plaque—was dedicated in 2017. From here, continue north on the continuation of the partly graveled Battleground Trail, which is quickly immersed again in the dense woods. It is a short walk from here to Sentinel Rock, a chunky boulder where retreating forces under the command of Colonel Halthorn briefly took up position after encountering Brant’s soldiers down by the river. Here the rebels would be effectively encircled, outnumbered and outgunned by the opposing force of Indians and Tories. Hanging a sharp right, the trail bounds southeast amid a mix of pines, oaks, beech, and maples and approaches a trail fork at about ¼ mile. Stay right, following the Battleground Trail as it passes another unmarked junction steps later. Stay left this time, then bear left again at a third fork just beyond. Heading back toward the stout ledges near the top of the hillside, the trail reaches Hospital Rock at 3/10 mile. 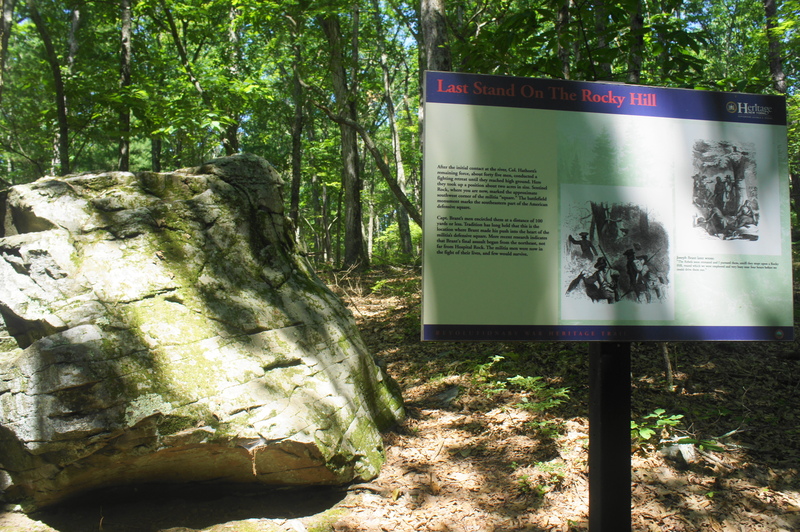 This was the last stand for much of the rebel contingent: 18 militiamen, including Lt. Col. Benjamin Tusten, were killed at or around this rock by the encroaching British soldiers. Beyond Hospital Rock, the Battleground Trail bears south and then begins a sharp descent. Stay right at the junction with the Woodland Trail at 4/10 mile. 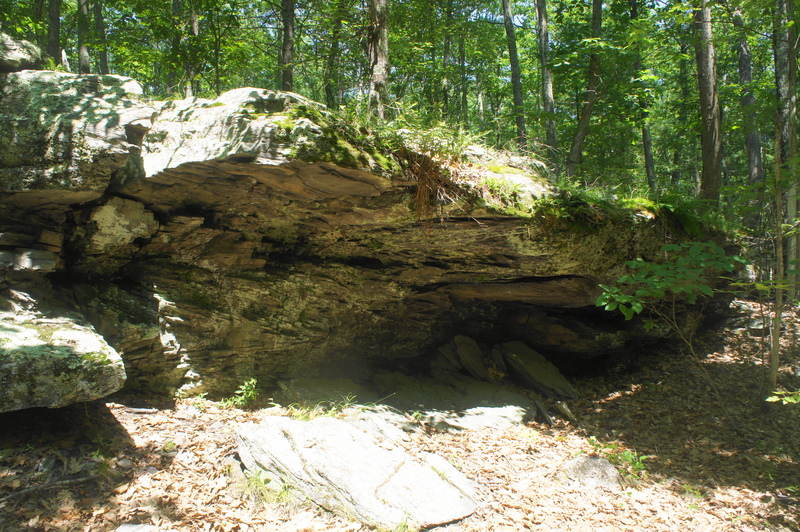 Around a minute later, hikers will approach another fork at Indian Rock, which was allegedly set by the Indians and Tories to honor their dead in the battle. Hikers can bear right here on the Battleground Trail to head back to the parking area. 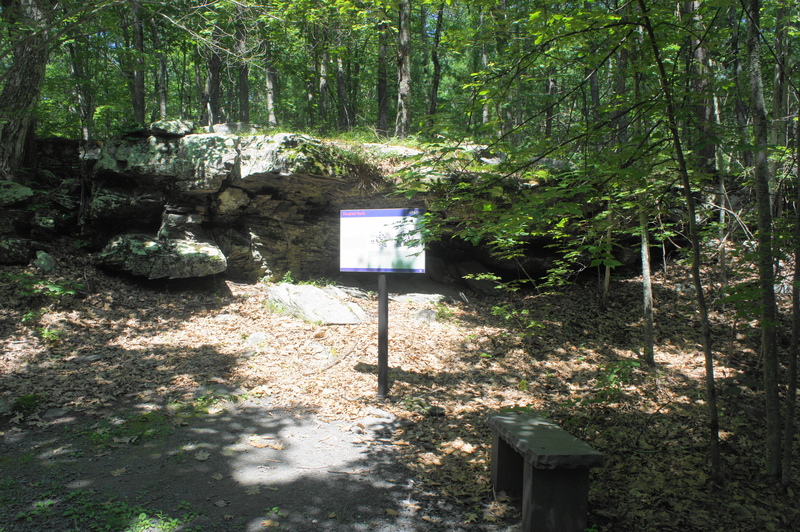 But those looking for a little extra can continue straight on the Old Quarry Trail, which, as the name suggests, explores a modest quarry to the south. Small cliffs are terrifically exposed in this area as the trail snakes between minor ditches on the left and right. An unmarked trail comes in from the left at 6/10 mile, and there is a single bench to rest your legs. Staying right, the path passes a vertical rock face with a golden hue: this was presumably the heart of the rock quarry. From here it a short walk to the Interpretive Center and parking area. After crossing the road, the incline briefly picks up during the final stretch back to the start. The trail ends at the backside of the center. Allot 30-45 minutes for this loop hike, or venture off to some of the spur trails to make for a longer walk of up to 2 hours. 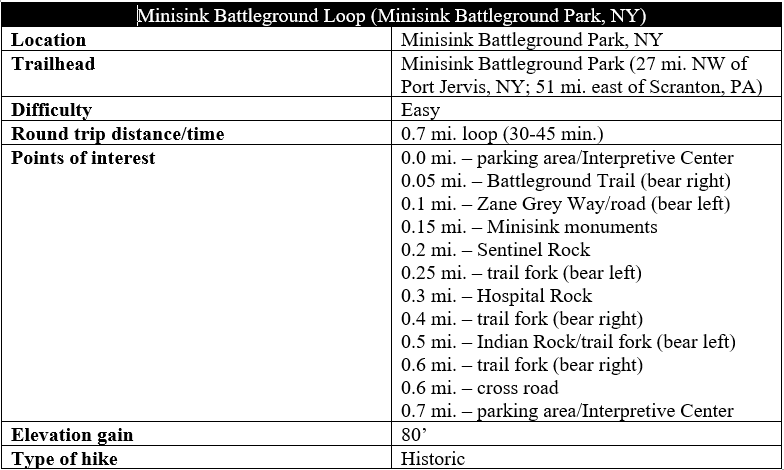 This entry was posted in Easy Hikes, New York and tagged Battle of Minisink, Battleground Trail, Delaware River, historic, Hospital Rock, Indian Rock, loop hike, Minisink Battleground, Minisink Battleground Park, New York, Old Quarry Trail, Revolutionary War, Sentinel Rock, Upper Delaware River, Upper Delaware Scenic and Recreational River, Woodland Trail. Bookmark the permalink.